Research has shown that when Merrill’s First Principles of Instruction are used as part of an instructional strategy, student learning increases. Several articles describe these principles of Instruction, including specific methods for implementing this theory. However, because teachers and designers often have little time to design instruction, it can be difficult to implement a comprehensive theory like First Principles of Instruction. Therefore, this article provides basic methods for applying First Principles, including several examples from the literature. It also provides a basic template for organizing a module or lesson plan using First Principles of Instruction. The issue of transferring theory into teaching practice is often discussed in the field of education, (De Corte, 2000; Defazio, 2006; Randi & Corno, 2007). For example, a recent study found that most courses in higher education, even those that are award-winning, do not effectively use First Principles of Instruction in their teaching strategy (Cropper et al., 2009). Without using sound theory in the educational practice, instruction can potentially fall short of its power to increase student learning. Research has shown that the use of First Principles of Instruction in education improves student learning and satisfaction (Frick et al., 2007; Merrill, 2006; Thomson, 2002). However, although several articles describe First Principles of Instruction (Merrill, 2002, 2006), including methods for implementing and evaluating these principles (Merrill, 2009), experience has shown it can be difficult to apply this theory into educational practice. This article therefore describes basic ways for instructional designers and educators to begin using Merrill’s First Principles of Instruction, including a template for designing instruction. Specific methods for applying each principle are also provided. A principle describes a relationship that is always true under appropriate conditions, regardless of program or practice (Merrill, 2002). Principles are different from methods, which are “ways to facilitate learning” (Reigeluth, 1999). For methods to effectively bring about student learning, they must be based on principles that describe a true relationship. Principles are often included in instructional theory, which “offers explicit guidance on how to better help people learn and develop” (Reigeluth, 1999). Merrill emphasizes that instructional design theory should address what actions to take and how and why we should take those particular actions (Merrill & Twitchell, 1994). Instructional theories describe how to teach effectively. They identify methods of instruction, which can be broken into detailed steps, and the situations in which those steps should be taken (Driscoll, 2005, p. 352; Reigeluth, 1999). Instruction is in the context of real-world problems or tasks and students are engaged in solving a sequence of increasingly complex problems or tasks. Students activate relevant cognitive structures and recall or acquire a structure for organizing new knowledge, which structure is used for instruction, coaching, and reflection activities. Students observe a demonstration of skills to be learned that is consistent with the content type, guides students to relate general information to specific instances, and uses media that is relevant to the content and appropriately used. Students engage in application of new knowledge that is consistent with the type of knowledge being taught, receive intrinsic or corrective feedback, and receive coaching that is gradually withdrawn for each subsequent problem or task. Students integrate their new knowledge or skill by reflecting on, discussing, or defending the new knowledge or skill, and exploring personal ways to use it and displaying it publicly. These five principles can be converted into four phases of instruction, occurring in the context of a real-world problem or task. See Figure 1. This four-phase process guides instructional designers and educators to bundle their teaching and learning activities in a way that improves student learning and that makes it easy to incorporate new methods within that process. The process begins with activation of students’ prior learning, followed by demonstration of new knowledge, student application of knowledge, and student integration of knowledge, all based on the real-world problem or task. Figure 1. Merrill’s First Principles of Instruction. Several research articles provide significant empirical and anecdotal support for First Principles of Instruction (Frick et al., 2007; Merrill, 2006; Thomson, 2002). Thomson (2002) showed how these principles were used to teach a potentially drab spreadsheet course. By using real-world scenarios and following the four-phase cycle of instruction, students achieved a 30% performance improvement over the traditional instruction, including a 41% improvement in time performance (p.8). In another study, Frick et al. (2007) found strong correlation between the use of Merrill’s First Principles and student satisfaction and perceived and actual performance in the class. In addition, several authors show how these principles have been applied in educational and corporate settings (Collis & Margaryan, 2005; Gardner et al., 2008; Gardner & Jeon, in press; Mendenhall et al., 2006). While the results of these studies and cases are impressive, it can be difficult to apply this theory. To help transfer these principles from theory into educational practice, this article will provide prescriptions based on a review of several instructional theories and case descriptions. This section describes instructional methods and strategies based on First Principles of Instruction. Several questions are asked followed by practical answers for applying First Principles of Instruction. Figure 2 is a worksheet for planning how to use these principles in a lesson or unit. How can I base my instruction on real-world problems or tasks? Real-world experience is the bedrock of all learning (Dale, 1996). The goal of the instruction should be to have students solve problems (Jonassen, 1999), so have students do performances that matter in the real world (Gardner, 1999). Make sure the problems are authentic (Nelson, 1999), useful (Dale, 1996), meaningful (Mayer, 1999), and intrinsically motivating to the student (Schank et al., 1999). The challenges should be easy at first (Burton et al., 1984) but be increasingly difficult as you move through the materials (Gardner et al., 2008; Perkins & Unger, 1999; Schwartz et al., 1999). Make sure your problems and tasks safely allow the practice of skills and subskills (Burton et al., 1984) and try to make them physical, tangible activities (Collis & Margaryan, 2005). How do I activate my students’ prior knowledge? Have your students relate or recall what they already know about the subject (Gardner et al., 2008; McCarthy, 1996). Try to choose subjects the students will relate to (Schank et. al., 1999) and build on your students’ relevant prior knowledge (Collis & Margaryan, 2005). Allow your students to “look ahead” and preview what they will learn (Schwartz et al., 1999). Let them see the problem(s) to be solved and the subjects they will learn (Mendenhall et al., 2006). Also, show them the process they will go through to solve these problems (Nelson 1999). Try to make the structure of the information and knowledge obvious by using a model to organize instructional materials (Darabi, 2002). Give your students a foundation to build new knowledge on. Give them a good reason for engaging in the problem (Jonassen, 1999). Tell stories, give them statistics, and provide hands-on activities (Gardner, 1999) upon which to build new knowledge. Discuss the fundamentals of the topic or give a simple analogy upon which to build the new knowledge (Mayer, 1999). How can I effectively demonstrate new knowledge to the students? Your students will learn a lot by watching you work, so model performance of the task as you teach (Collins et al., 1991). Teach and model the entire task (Gardner et al., 2008; Mendenhall et al., 2006). Give varied examples of the topic (Gardner, 1999), and related cases and information sources (Jonassen, 1999), including multiple expert perspectives (Schank et al., 1999; Schwartz et al., 1999). This will broaden your students’ understanding. Be sure to make the structure of the knowledge clear (Mayer, 1999) by following and referring to the organizing model for the knowledge. Be sure to have students relate new knowledge to old knowledge (McCarthy, 1996) to promote encoding of new knowledge. Encourage your students to ask questions during the demonstration (Gardner et al., 2008) and give them instruction as they request or need it (Nelson, 1999). To broaden student understanding, tell analogies and metaphors (Gardner, 1999). Focus your students’ attention by asking questions (Nelson, 1999) and summarizing your instruction (Mayer, 1999). Make your thinking obvious to the student (Collins et al., 1991). How do I have students apply this new knowledge effectively? Have your students use what they have been taught (McCarthy, 1996) and spend significant time on practice (Schank et al., 1999). Your students’ activities should include problem-solving activities and you should have them apply new skills in a realistic setting as soon as possible (Keller, 1987). 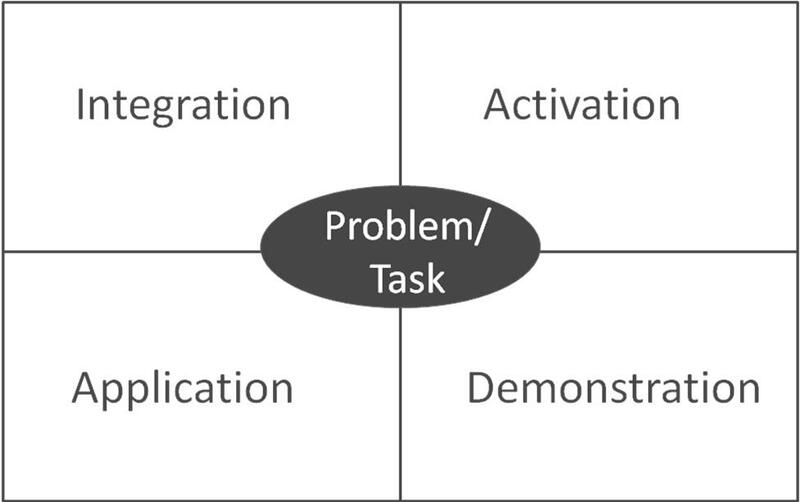 Students should solve as much of the problem or task as possible at each stage (Mendenhall et al., 2006). Problems and tasks should be done in the actual environment using real workplace situations and resources (Collis & Margaryan, 2005). Help your students be cognitively active (Mayer, 1999) by having them solve problems. You can even encourage them to solve problems as a group (Nelson, 1999). 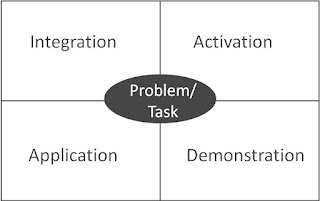 Have them recognize and articulate the elements that are common across the differing problems and tasks you have them solve (Collins et al., 1991). Give your students coaching and feedback (Burton et al., 1984; Collins et al., 1991; Nelson, 1999; Perkins & Unger, 1999). Feedback should occur frequently (Darabi, 2002; Perkins & Unger, 1999). Your feedback may need to be visually demonstrated so that students can see their error (Burton et al., 1984) and should be based on clear criteria (Perkins & Unger, 1999). Help your students use your feedback to bring their performance closer to the level of an expert (Collins et al., 1991) and to plan future performance (Perkins & Unger, 1999). When you praise successful work, be sure to attribute the students’ success to their effort, not luck or ease (Keller, 1987). Provide more guidance initially, reducing it as expertise is developed (Gardner et al., 2008). How do I encourage students to integrate this new knowledge into their everyday life? Have your students reflect on what they learn (Collis & Margaryan, 2005; Gardner et al., 2008; Jonassen, 1999; Nelson, 1999; Perkins & Unger, 1999; Schwartz et al., 1999), describing their experiences and challenges in applying what is taught (Darabi, 2002). Have students relate their new knowledge to future goals (Keller, 1987). As well, have students leave tips and ideas for future students (Schwartz et al., 1999). Have your students take part in a culminating performance that includes students and parents outside the class (Perkins & Unger, 1999). Afterwards, show the students a recording of their performance (Jonassen, 1999). What real-world, relevant problem or task will the learner be able to perform when we finish this lesson or unit? How will you activate the learner’s prior knowledge about this subject and prepare them to learn? How will your students preview what they will learn? How will you show the learner how to perform the real-world problem or task? What various examples of the problem or task will you give your students? How will your learner practice solving the problem or task? How will you give them feedback on their performance? How will you encourage your learner to integrate this new knowledge and skill into their life? How will they reflect on, discuss or debate this new knowledge? The diverse ways that First Principles of Instruction are used in these theories and cases is refreshing, and one can recognize the abundant theoretical and anecdotal support for First Principles of Instruction in the articles cited. By understanding the purpose of the principle and using it in a way that matches design style and personal preference, instructional designers can apply these principles in natural, meaningful ways. This article is designed to provide teachers and instructional designers with ideas for creating effective instruction. The goal is to provide a framework for organizing teaching and learning activities in a way that is easy to implement and beneficial to students. Designers are encouraged to use the worksheet provided in Figure 2 to plan how to apply these principles. By doing so, one can expect an increase in student learning and satisfaction. It is often difficult to transfer theory to practice instructional design. This description of how several theorists and designers use Merrill’s First Principles of Instruction should generate ideas for applying this theory in design practice. As well, the template found it Figure 2 provides structured, basic methods for application. Merrill has synthesized and distilled First Principles of Instruction through a lifetime of research, practice and synthesis. Using these principles increases the efficiency and effectiveness of instruction. Most importantly, instructional designers and educators who use these principles will increase student learning and satisfaction by engaging them in solving meaningful problems and tasks. Burton, R. R., Brown, J. S., & Fischer, G. (1984). Skiing as a model of instruction. In B. Rogoff and J. Lave (Eds. ), Everyday cognition: Its development in social context (pp. 139-150). Cambridge, MA and London , Harvard University Press. Collins, A., Brown, J. S., & Holum, A. (1991). Cognitive apprenticeship: Making thinking visible. American Educator, 15(3), 6-11. Collis, B., & Margaryan, A. (2005). Merrill plus: Blending corporate strategy and instructional design. Educational Technology, 45(3), 54-58. Cropper, M., Bentley, J., & Schroder, K. (2009). How well do high-quality online courses employ Merrill's first principles of instruction? In M. Orey, V. J. McClendon, & R. Branch (Eds. ), Educational media and technology yearbook (Vol. 34, pp. 121-140). New York: Springer Publishing Company. Dale, E. (1996). The "cone of experience." In D. P. Ely & T. Plomp (Eds. ), Classic writings on instructional technology (Vol. 1, pp. 169-180). Englewood, CO: Libraries Unlimited. Darabi, A. (2002). Teaching program evaluation: Using a systems approach. American Journal of Evaluation, 23(2), 219. De Corte, E. (2000). Marrying theory building and the improvement of school practice: A permanent challenge for instructional psychology. Learning and Instruction, 10(3), 249-266. Defazio, J. (2006). Theory into practice: A bridge too far? AACE Journal, 14(3), 221-233. Driscoll, M. P. (2005). Psychology of learning for instruction (3rd ed.). Needham Heights, MA: Pearson Education, Inc.
Frick, T., Chadha, R., Wang, Y., Watson, C., & Green, P. (2007, December 11). College student perceptions of teaching and learning quality. Educational Technology Research and Development. Retrieved June 19, 2009, from http://www.springerlink.com/content/722jm250401j7l77/fulltext.pdf. Gardner, H. E. (1999). Multiple approaches to understanding. In C. M. Reigeluth (Ed. ), Instructional-design theories and models: A new paradigm of instructional theory (Vol. 2, pp. 69-89). Mahwah, NJ: Lawrence Erlbaum Associates, Inc.
Gardner, J., Bentley, J., & Cropper, M. (2008). Evaluating online course quality: Teaching evaluation using first principles of instruction. Midwest Journal of Educational Communication and Technology, 2(2), 1-7. Gardner, J., & Jeon, T. K. (in press). Creating task-centered instruction for web-based instruction: Obstacles and solutions. Journal of Educational Technology Systems. Glesne, C. (2006). Becoming qualitative researchers: An introduction (3 ed.). Boston, MA: Pearson Education, Inc..
Jonassen, D. (1999). Designing constructivist learning environments. In C. M. Reigeluth (Ed. ), Instructional-design theories and models: A new paradigm of instructional theory (Vol. 2, pp. 215-239). Mahwah, NJ: Lawrence Erlbaum Associates, Inc.
Mayer, R. H. (1999). Designing instruction for constructivist learning. In C. M. Reigeluth (Ed. ), Instructional-design theories and models: A new paradigm of instructional theory (Vol. 2, pp. 141-159). Mahwah, NJ: Lawrence Erlbaum Associates, Inc.
McCarthy, B. (1996). About learning. Barrington, IL: Excell, Inc.
Mendenhall, A., Buhanan, C. W., Suhaka, M., Mills, G., Gibson, G. V., & Merrill, M. D. (2006). A task-centered approach to entrepreneurship. TechTrends, 50(4), 84-89. Merrill, M. D. (2006). First principles of instruction: A synthesis. In R. A. Reiser & J. V. Dempsey (Eds. ), Trends and issues in instructional design and technology, 2nd Edition (Vol. 2). Upper Saddle River, NJ: Merrill/Prentice-Hall, Inc.
Merrill, M. D. (2009). Finding e3 (effective, efficient, and engaging) instruction. Educational Technology, 49(3), 15-26. Merrill, M. D. & Twitchell, D. (1994). Instructional design theory. Englewood Cliffs, NJ: Educational Technology Publications. Nelson, L. M. (1999). Collaborative problem solving. In C. M. Reigeluth (Ed. ), Instructional-design theories and models: A new paradigm of instructional theory (Vol. 2, pp. 241-267). Mahwah, NJ: Lawrence Erlbaum Associates, Inc.
Perkins, D. N., & Unger, C. (1999). Teaching and learning for understanding. In C. M. Reigeluth (Ed. ), Instructional-design theories and models: A new paradigm of instructional theory (Vol. 2, pp. 91-114). Mahwah, NJ: Lawrence Erlbaum Associates, Inc.
Randi, J., & Corno, L. (2007 ). Theory into practice: A matter of transfer. Theory into Practice, 46(4), 334-342. Reigeluth, C. M. (1999). What is instructional-design theory and how is it changing? In C. M. Reigeluth (Ed. ), Instructional-design theories and models: A new paradigm of instructional theory (Vol. 2, pp. 5-29). Mahwah, NJ: Lawrence Erlbaum Associates, Inc.
Schank, R. C., Berman, T. R., & Macpherson, K. A. (1999). Learning by doing. In C. M. Reigeluth (Ed. ), Instructional-design theories and models: A new paradigm of instructional theory (Vol. 2, pp. 169-181). Mahwah, NJ: Lawrence Erlbaum Associates, Inc.
Schwartz, D. L., Lin, X., Brophy, S., & Bransford, J. D. (1999). Toward the development of flexibly adaptive instructional designs. In C. M. Reigeluth (Ed. ), Instructional-design theories and models: A new paradigm of instructional theory (Vol. 2, pp. 183-213). Mahwah, NJ: Lawrence Erlbaum Associates, Inc.
Thomson. (2002). Thomson job impact study: The next generation of learning [electronic version]. Retrieved June 13, 2009 from http://www.delmarlearning.com/resources/job_impact_study_whitepaper.pdf. Gardner, J. (2010). Applying Merrill’s First Principles of Instruction: Practical Methods Based on a Review of the Literature. Educational Technology Magazine. 50(2), pp. 20-25. Joel, your article offers great practical advice and organizes the First Principles in a way that makes them easier to understand and apply. The lesson plan template is especially helpful. I recently gave a workshop for librarians about The First Principles and could have used that template for a handout. I hope to be offering more sessions on these concepts so I will surely be using it in the future. I agree that a clear focus on authentic learning may be the link between FPI and Connectivism. It occurs to me that the element of self-directed learning is also universally important. Thanks, Laurie. Let me know if I can be helpful in any way. It is my belief that teaching in a problem or task-centered manner will help learners become more self-directed, especially when the guidance and feedback fades as the student gains expertise. It might be worth looking at this article, as well, which shows how First Principles have been used by expert teachers in higher education: http://joelleegardner.blogspot.com/2011/10/article-how-award-winning-professors-in.html .